SM81, Small diaphragm condenser microphone from Shure belonging to the SM81 model. 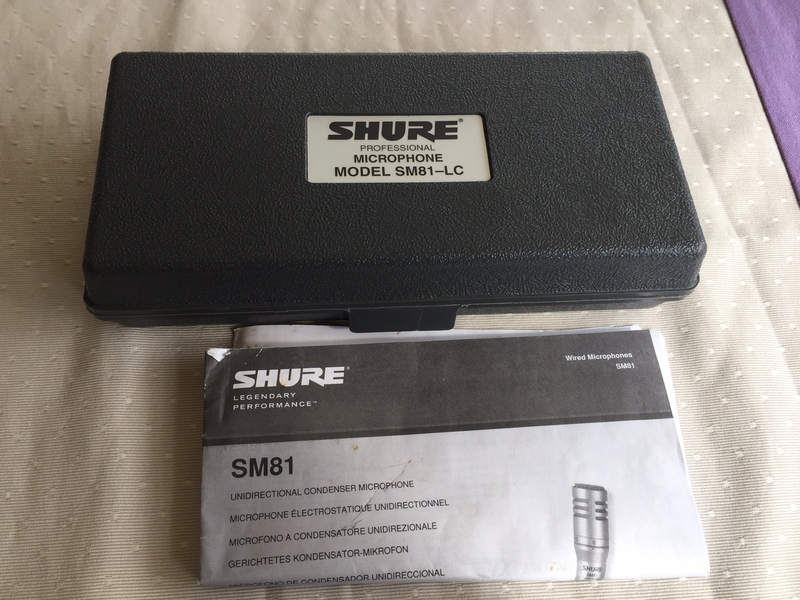 JimboSpins's review"Be Gentle With It"
The Shure SM81 is a small diaphragm cardioid condenser microphone. The price tag is on the high end for a small condenser microphone but it is well worth the 350 dollars spent. The new design of the SM81 is very slim and sleek. This is the perfect microphone for your overhead cymbals. It has an unidirectional design to it which makes it perfect for your over head microphone and it will capture the full dynamic sound of your cymbals. It can also be used to capture a full sound of a choir or a group of singers at the same time because it does a great job of picking up the sound coming from all directions of the microphone. 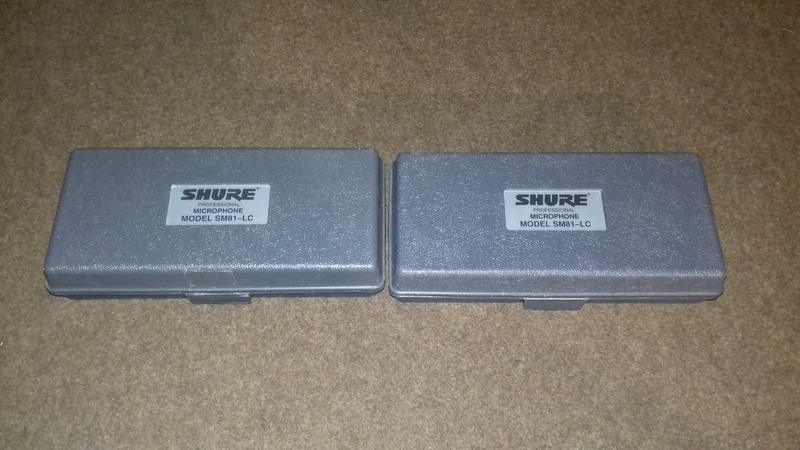 The Shure SM81 comes with a nice hard case to carry your SM81 in so it doesn’t get damaged. These microphones are a lot more fragile than the average Shure small diaphragm microphones are. 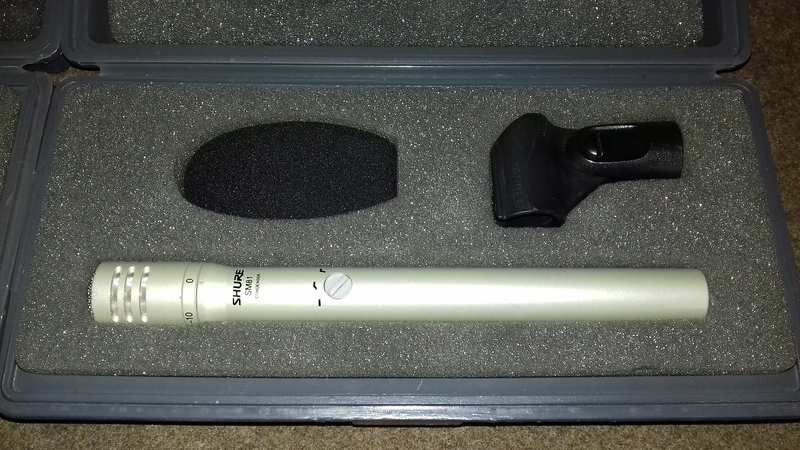 You will need to take care of this microphone and protect it where ever you are. 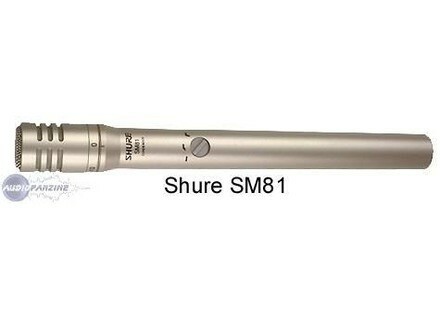 The Shure SM81 can be used on a number of different instruments in either a live or studio setting. This microphone is a multi purpose microphone that can do it all. I plan on picking up a couple more of the Shure SM81’s to have has over head microphones in the near future. If you use this microphone as an over head microphone you may need to roll of some of the lower frequencies when you go to do your mixing, or put a high shelf filter on it. This will make the recording sound complete and give you a clean mix. Overall , it is a great microphone that can be used in many situations and with many different instruments. Just keep a good eye on it and take care of it. They are pretty fragile and one bad drop could waste your 350 dollars. 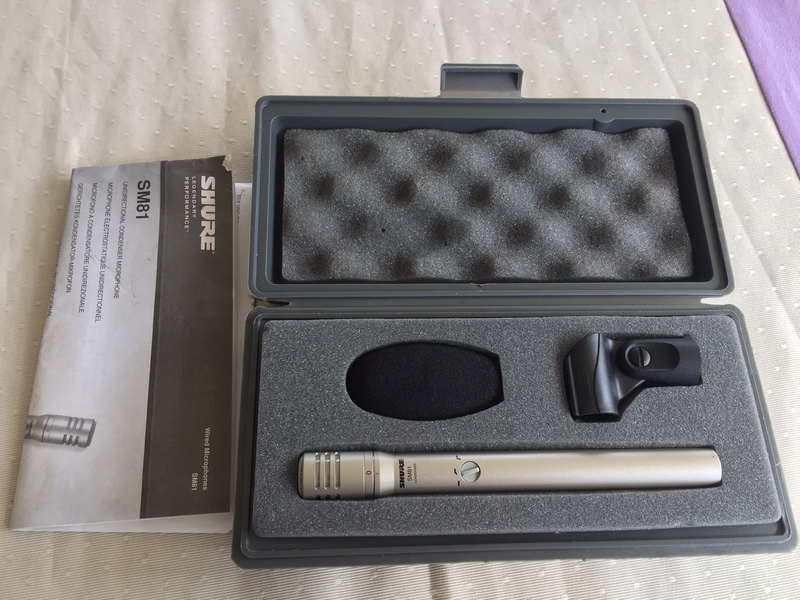 The Shure SM 81 is a condenser mic that is similar to a few other mics made by Shure. The only difference is in this one is that it’s a smaller sleeker design and a different color. Maybe a little more stylish. This mics sound is very natural meaning that however you play and what you hear when you play is pretty much exactly how it will sound when it comes out of the speakers or when it goes to get mixed down and or mastered. It has a very natural sound that is great for overhead drum mics. The SM 81 can take the sharp punchy sounds of drums and keep them clean without any distortion like some cheaper mics will. Not that this mic is too expensive, it is a very affordable mic and will work great for you for a long time. It really doesn’t matter wether you are recording in an acoustic environment or you are in a club on a stage. The mic will sound perfect in almost any situation imaginable. If you purchase one of these , it wont take long before you go out and want to purchase more for your over head set ups. I have first got introduced to this mic years ago from a friend who was using it, and I knew that I had to have it because of the way he talked about it. Since that first conversation with him I have then purchased a total of 3 of these and still use these to this day and will continue to use them for as long as they hold up. Even if something where to happen I would go out and purchase another one quickly , I cant live without the SM 81 it has been very good to me over the years. James...'s review"Sounds good on everything!" I like to call this the SM57 of condensers because of its versatility. It's meant to be primarily an instrument mic, but unlike a lot of condensers, you can use them on literally everything and it somehow sounds good. Usually you will find these in studios but they are definitely usable in a live situation too. If you know what you're doing, it's abilities are far reaching. I also like that it has the filter switch on the side. In certain live situations it comes in handy. I originally bought a pair of SM81's to use for my drummer's overheads. I was really really pleased with them in this setting. I quickly learned that while this mic sounds very transparent, it also has some kind of boost in the mid range that makes drums sound more "shimmery." Our drummer uses in ears and he agreed with me that the mix from the 81's sounds almost better than hearing his actual kit! After my initial success, I started using them for other things. One day I was tracking acoustic guitar in the studio and my large condensers didn't sound quite right in the mix. I set up my 81's together just to see what would happen. They gave my guitar the extra presence it needed to get heard on my track. Since then I've frequently returned to that setup a few times. I found later that the 81's sounded great on piano and pretty much any stringed instrument. The 81 really captures the character of anything it records, almost to a fault in some cases. It's very accurate and the extra presence it adds will definitely make sure mistakes are heard well. So be careful. Overall though I can't recommend these enough. They are tricky to learn how to use and you may not like them on everything, but I think every studio or venue could use a couple. The Shure SM81 is a small diaphragm condensor microphone. I have used this mic mostly in the studio, but it can be used in either a live setting or a recording studio. It has a couple of low pass filters on it and it has a cardioid polar pattern. It's design makes it easy to place in tight spaces and perfect for picking up high end frequency signals. Shure makes a variety of microphones, and I think that these are not only some of the best small diaphragm condensers made by Shure, but are some of the best on the entire market. I've been using the Shure SM81s for about four years. I have always trusted the value I am getting when I get a Shure microphone and this mic is no exception - they make sturdy mics that sound great. These mics in particular is great for a number of applications where it is vital to pick up that silky high end signal. I use these on drum overheads, acoustic guitars, acoustic pianos, and other assorted acoustic string instruments. These are great mics for these applications as it is sensitive and will pick up all of the brilliance you want when recording acoustic guitars and pianos. These also sound great on banjos and mandolins as their design is perfect for these types of instruments. As for the price, these are somewhere in between Rode NT5s and Neumann KM184s, and are also in between these other mics in terms of sound quality, in my opinion. The SM81s to me sound better than the NT5s but as far as I am concerned the KM184s reign supreme for acoustic guitar and drum overheads. These are a great option for those who want a great small diaphragm condensor that won't clear out your bank account. All in all these are great sounding mics from a company that will give you some very well built mics at very reasonable prices.